How to make Desktop 3D ? Download Bumptop Pro for free. 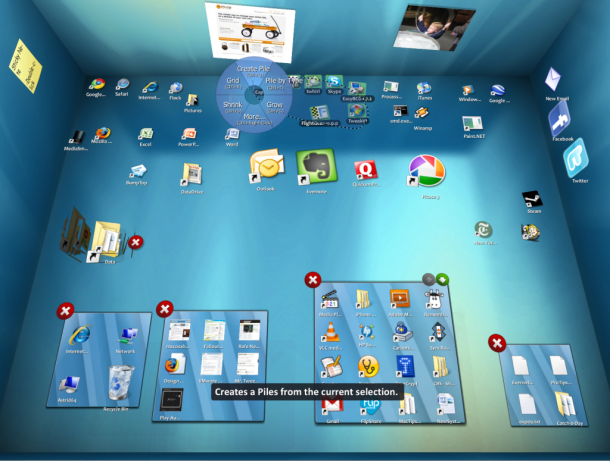 BumpTop will turn your desktop into a 3D Desk.You will find that your desktop looks like a room with four walls,where you can hang pics,icons ,create a pile of icons,files etc.Its just like we do in real life.BumpTop allows you to organize ,visualize, personalize and Socialize. By default you are provided with Facebook and Twitter icons from where you can connect with your friends.There is also an email icon for managing your emails.The Flicker photo Feed make your walls look more attractive with continuously changing beautiful images from flicker.Though this function requires internet connection but its worth. Another Feature is that you can add sticky notes and pin them on your walls.Its really useful for people who spend more time on their computer.There are loads of features available in BumpTop.you need to use it to discover it.The video below will provide you a better idea on what is BumpTop and how to use it .Seriously guys , Give it a try. More than three years ago, we set out to completely change the way people use their desktops. We’re very grateful for all your support over that time — not just financially but also through all the encouraging messages from people who found BumpTop inspiring, useful, and just downright fun. Today, we have a big announcement to make: we’re excited to announce that we’ve been acquired by Google! This means that BumpTop (for both Windows and Mac) will no longer be available for sale. Additionally, no updates to the products are planned. For the first week of May 2010, we kept BumpTop Free available for download to give BumpTop fans one last chance to grab a copy. BumpTop is now no longer available for free download. Thanks again for all your support over the years. Despite our change in strategy, we remain as passionate as ever about helping shape the future of computing!